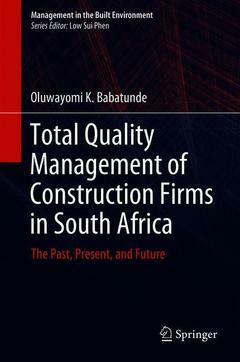 Total Quality Management of Construction Firms in South Africa Babatunde Oluwayomi K.
Add to cart the livre of Babatunde Oluwayomi K.
This book presents an overview of the construction industry in South Africa, including the roles of the major players in South Africa?s built environment. In addition, it includes a three-year empirical and theoretical research study on Total Quality Management (TQM) among construction firms in South Africa, which utilizes the theory of diffusion of innovations (TDI) as a theoretical framework for investigating TQM development among local construction firms, while also drawing on the theory of reasoned action (TRA) and planned behavior (TPB) to delineate the adopter categorization that emerged from the TDI. The book will benefit a broader audience, including built environment practitioners (architects, engineers, quantity surveyors, valuers, and project managers), policymakers, academics and research students. The Field of Management.- Integrative Review of Literature on TQM.- Construction industry in South Africa.- Theoretical and conceptual framework for TQM in South Africa.- Research design and method.- Data analysis.- Discussions and conclusions.- Epilogue – The past, present, and future of TQM in South Africa. Dr Oluwayomi Kayode Babatunde is a Senior Lecturer at the School of Construction Economics & Management, University of the Witwatersrand, Johannesburg, South Africa, where he teaches Construction Project Management at the undergraduate and graduate levels. His research interests are in the areas of Total Quality Management, International Project Management and Construction Project Management Education. He holds PhD and MSc (Project Management) degrees from the Department of Building, National University of Singapore; MArch and BSc (Hons) (Architecture) degrees from the Department of Architecture, Obafemi Awolowo University in Nigeria; and a Postgraduate Diploma in Education from the University of the Witwatersrand. He is a Registered Member of the Society of Project Managers (Singapore), International Construction Project Management Association (Switzerland), and Professionalization Portfolio Member of the South African Facilities Management Association. He currently serves on the editorial review boards of The TQM Journal (United Kingdom) and Journal of Construction Business and Management (South Africa).